A castle in front of the door is comonplace in the ,,Münsterland”. But "Wasserschloss Vornholz" is a special jewel in the neigbourhoud of Hotel Kröger. Our Hotel is the ideal starting point for a tour of the castles of Münsterland. Whether you hike, ride or bike or visit by car, Hotel Kröger offers a cozy and modern furnished home for your vacation in Münsterland. 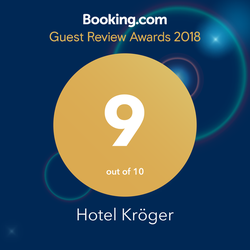 With a golf course and a large horsr farm nearby, a holiday at Hotel Kröger can provide all the variety that Münsterland has to offer and every member of the family van find something exciting to do. Münster is not far away and is well worth a day trip. Ask our team for tips to the most beautiful sights.